By the courtesy of the builders, Messrs. Peckett and Sons, of Bristol, we are enabled to illustrate one of two tank locomotives recently supplied by them to the Anglo-Persian Oil Co. Ltd. for service on their narrow gauge railway lines in the Abadan oil depot. The engine has cylinders 10 in. dia. by 15 in. stroke, and six-­coupled drivers 2 ft. 6 ½in. dia. ; the "pony" truck under the cab has wheels 1 ft. 8 in. dia. The boiler has a barrel 3 ft. 1 ½in. dia. and 7 ft. 5 in. long, with ninety-eight steel tubes 1 ¾in. external diameter; the firebox also is of steel, 3/8 in. thick (tube plate ½in. ), with a grate area of 10 sq. ft. The heating surface is 398 sq. ft., of which the tubes contribute 343 sq. ft. and the firebox 55 sq. ft.; the steam pressure is 180 lb. per sq. in. The weight of the engine empty is 19 ½ tons, whilst loaded and in running order it amounts to 23 tons, carries 520 gallons of water and 200 gallons of fuel oil. The wheelbase is 12 ft. 4 in., of which 7 ft. 6 in. is fixed. Steam and hand-brakes are provided, and the engine is equipped with steam sanding gear, a valuable accessory where there is a likelihood of oil being present at times on the track. Centre couplers of the Norwegian hook type by the A.B.C. Coupler Co. are used. Painted bright green, finished with black bands having brilliant yellow stripes on each side, this locomotive has a very smart and attractive appearance reflecting credit to the builders in turning out such a useful machine. 0-6-2 tank locomotive, 2 ft. 6 in gauge, for the Anglo-Persian Oil Co., built by Peckett and Sons, Bristol. This locomotive is No.1750, 'D.I.K 1928', of February 1928, a Peckett Type M5. As the oil burning arrangement will be of special interest to many of our readers abroad, we append a drawing showing the arrangement of the firebox, with its brickwork furnace, air ports, etc. Two oil burners of the Kermode type are used, supplied with steam for the spraying jets from a turret fitting, placed high up in the cab, which also accommodates the injector steam valves, the blower, whistle, and pressure gauge; a master valve is provided by which all these fittings can be shut off at any time with the locomotive under steam. The position of the burners and pipe connections for oil and steam are distinctly shown on the drawing; these are said to give excellent results in service. A novel device is fitted for raising steam, when this has to be done away from any stationary supply, and this was also supplied by Messrs. Kermode's. A coil of steel pipe, which has a fine spraying jet, or nozzle, at its extremity, is temporarily introduced into the furnace; oil fuel is supplied to this coil from a small hand pump, fixed, as shown, on the front of the oil tank. Lighted waste having been thrown in, a supply of oil fuel is maintained under pressure in the coil and sprayed from the fine "rifled" nozzle at the end. After a few minutes, quite a bright fire results, and the firebrick becoming heated sufficiently to ensure good combustion, steam can be raised from cold water in from sixty to seventy minutes. As soon as 10 lb. pressure is reached the fixed burners can be started, the temporary coil removed, and the pressure rapidly raised to the full working figure. The railway system of the Anglo-Persian Oil Co. is laid to the 2 ft. 6 in. gauge, and extends to some forty miles, linking up the different oil wells at Masjid-i-Sulaiman and providing means of transport for stores and supplies between that district and the depot at Abadan, which is also the port of shipment for the oil. This article was first published in 'The Locomotive Magazine and Railway Carriage & Wagon Review' on 14 March 1931. My thanks to Simon Bowditch for sending me a copy. The Anglo-Persian Oil Co. must have been happy with their locomotive as Peckett's later supplied two more machines. Locomotive No.1816 of October 1930, named 'D.I.K. 1930' came first and was followed by No.1909, 'D.I.K. 1936' in October 1936. No.1909, 'D.I.K. 1936' of October 1936. 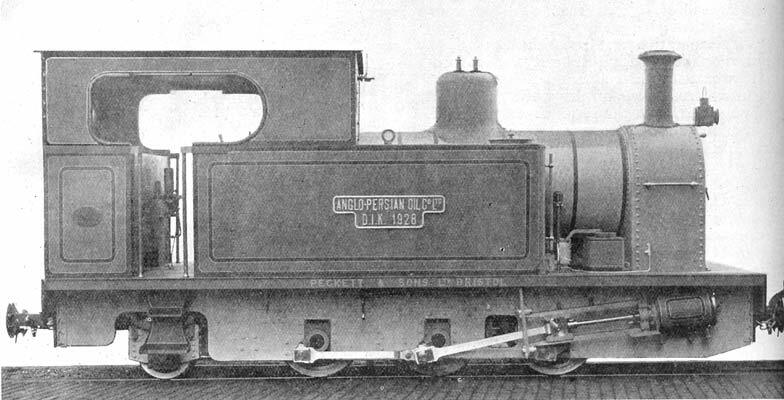 It is suggested this photograph may be a re-touched version of the photograph above showing No.1750.